The GIW® Minerals LCV heavy-duty vertical pump is the answer for the most aggressive corrosive and abrasive slurry applications. 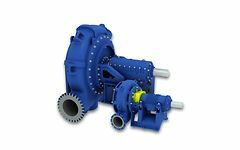 The GIW® Minerals FGD pump provides high sustainable hydraulic efficiency, and long wear life. The GIW® Minerals Mega Slurry is a high-performance, low maintenance slurry pump recommended for coarse or fine particles.